The Web is such a powerful and comprehensive medium that we usually consider it as a world apart. But the Web fully develops its potential when combined with other media. For example, when integrated with broadcast media such as radio and TV, it can provide the interactivity and in-depth content that broadcast media cannot offer. On the other hand, broadcast media can provide the massive audience Web sites usually lack. Moreover, digital formats are making media boundaries less and less significant, and increasingly media products (such as TV formats) are thought of as structurally multi-media. The concept of medium is now crossing the borders of traditional media like radio or newspapers. Pervasive and mediated environments such as conventions, theme parks, and museums are nowadays considered media. The paper will present case histories of successful and interesting integration of the Web and other media, with a specific focus on cultural usages. For example, a very successful TV program by Channel 4, TimeTeam Big Dig, used the Web to involve its watchers in a vast collective archaeological experiment in the UK, with unexpected results. Also, integration between Web and radio was the key for the success of Lifegate, a small local Italian radio station that combined in a very effective way the different characteristics of the two media. Now one of the most important radio stations in the area, Lifegate simply would not exist without the Web. Another successful case of integration was MuVi, a cultural program from another Italian radio station. 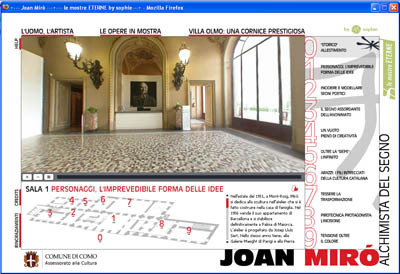 MuVi asked people to send old photos to the Web, rapidly creating a vast and valuable on-line visual database of recent Milan history; in this case the radio was key to reach audiences (older people) not reachable via the Web, and to create a sense of community necessary for the collecting operation. Finally, by examining the main characteristics of the Web as they emerge in comparison to other media, we will have a look at how far the Web has been integrated with the Museum as a medium, trying to get from this analysis some suggestions for future steps in this direction. Looking back on the period between 1995-2000 - when the media industry's interest in the Internet was at its height and the Internet itself was quickly spreading - we can recognize two conflicting ideas about the relation between media and the Internet. the idea that the Internet was going to cause the end of mass media. For example, the techno-utopian thesis stated that mass media were going to disappear under the pressure of the Web and its features like personalization. Others thought that users were going to re-orient their budget-time to Web surfing, to the detriment of media consumption. the idea that the Internet itself was going to lose most of its features under the colonization of media industries, becoming a mass medium with all the negative connotations that come along with the idea of "mass" media: big, profit-oriented conglomerates speaking to indistinct and basically passive audiences. (Of course, this description of media is very naïve and has been criticized by media theorists and sociologists, but we don't have time to go trough this now. Among others, see Thompson, 1995). Both scenarios were based on the idea that the relationship between new (i.e. the Internet) and old (i.e. broadcast and published) media could be described in terms of one impacting on the other and producing dramatic changes. Ten years later, nothing like this has happened. Mass media are still very much alive, and the Internet fully conserves its distinguishing features: it is still a dialogic, horizontal and plural space of content production and consumption. In the meantime, more technological change is occurring: broadband and wireless connections promise to open up new spaces for media industries on-line. A new revolution is announced, and again the questions arise. What's next? What will the relationship between media and the Internet be in the era of broadband and wireless connections? How will the press, radio and television be affected by the Internet, and how will the Internet be affected by old media? These questions are still open and not easy to answer. Probably they will never be answered if we keep on thinking in terms of two different realms impacting on one another, and if we keep on forgetting that mere technological innovation doesn't imply automatic social innovation, i.e. new media content or new styles of media production and consumption. (On the mutual shaping of social and technological dimension in digitalization, see, among others, Dutton (1996); Flichy (1999); Haddon and Silverstone (2000)). [Cyberspace] is very much a part of our contemporary world and . . . it is constituted through a series of remediations. As a digital network, cyberspace remediates the electric communications networks of the past 150 years, the telegraph and the telephone; as virtual reality, it remediates the visual space of painting, film, and television; and as social space, it remediates such historical places as cities and parks and such 'nonplaces' as theme parks and shopping malls. Like other contemporary telemediated spaces, cyberspace refashions and extends earlier media, which are themselves embedded in material and social environments. (Bolter and Grusin 1999, p. 183). Before continuing, we need be explicit about what we mean by media system and by media and explain how these concepts are relevant to the Internet and to museums. the artifacts or devices that enable and extend our abilities to communicate; the communication activities and practices we engage in to develop and use these devices; and the social arrangements or organizations that form around the devices and practices (Livingstone and Lievrouw, 2002, p. 7). Of course it is an extremely broad definition, but it is of some merit: it lets us include a variety of apparatuses devoted to mediations between people, cultures etc. (and from this point of view, museums certainly are media), and it focuses our attention on the network of innovation involving technologies and social practices (institutional strategies, audience tactics, etc). On the production side, we see more integration of media and telecommunication industries. This convergence is important because it brings about a redefinition of the production processes, opening spaces to new actors. For example, the transition to digital TV favors the separation of content provider and network provider. In the analog TV era, whoever owned the TV network was usually also the content provider. Digital TV is more akin to the Web, where connection providers are not the only or even the main content providers. In the near future, museums themselves could be effective TV content providers in the same way they are Web content providers today. On the product side we see how digital formats are making media boundaries less and less significant, and increasingly media products (such as TV formats) are thought of as structurally multi-media. Big Brother, for example, was projected as a traditional TV program and pay-per view TV, Web, press and radio product. This has at least two relevant consequences. First, products live longer and become more complex. The product must be flexible in order to be easily used in different media. Second, content providers need to protect not only finished products but also format ideas, thus making the whole copyright subject even more difficult to define. On the consumption side, we see how people tend to use different media on-line and off-line, creating their own media-mix. Bricolage: on-line music selling, for example, allows the user to buy single songs instead of complete albums and easily to create a personal compilation. Now in a few moments it is possible to record a CD suitable for a particular occasion or state of mind. On-demand products are easily mixed; for example, Windows Media Center in the latest version of Microsoft Windows, is focused on empowering non-expert users to create their own picture slideshows and movies, add soundtracks, and quickly burn Video DVDs and Audio CDs, all with a remote control. Community: identity-building and participative dimensions of media products are becoming increasingly important for users. This is evident for the Web, but traditional media are also creating more and more formats, such as Reality-TV shows, to fulfill this desire and exploit it on their Web sites where, for example, broadcasters maintain and encourage official and unofficial fan sites. Self-Production of Content: users are increasingly publishing their own content, text or images (and, increasingly, videos and MMS - see for example www.theworldssmallestfilmfestival.com) on the Web. The success of blogs, so easy to use and link to each other, is symptomatic of a social desire to provide and share content, personal thoughts, and impressions. All these three levels are put into action when it comes to cooperative production of content. For instance, in the Wikipedia project www.wikipedia.org users publish specific subject contributions that can be modified and integrated by other users; this advanced form of cross-control is producing good-quality results and an interesting knowledge-producing model that is both innovative and functional. In this sense the Web is a powerful tool to collect knowledge from the audience to create a knowledge base that can be promoted and developed by cultural institutions; this dimension of audience activity is the fil-rouge connecting all the case histories we are going to present. Since 1982, Channel 4, an English public TV channel, has been placing a premium on innovation, originality and diversity. It has probably been Britain's most cutting edge, controversial and creative broadcaster of the last two decades. Time Team is one of its most successful and interesting programs: challenged with a deadline of three days, a team of archaeologists excavates sites found in the backyards of common people all over the UK, as well as sites under parking lots or National Heritage sites. As one fan wrote: "This show pushes the boundaries of archaeology outward and invites public participation in the science while at the same time insisting on adherence to formal methodologies!" In June, 2003, the Time Team sponsored a special event called The Big Dig. Nearly 8000 people volunteered for a week to dig a pit in their backyards and participated in a vast cataloguing of archaeological resources in the UK. We will focus on this event, the Big Dig, because it was a huge television success (20% audience share in Britain), certainly an historic hit for an archaeology program and a very interesting mix of Web and TV. An interactive Flash MX map used to navigate the UK, sorted into 14 regions, fully searchable by keyword. The Big Dig map showed the location of the 30 participating digs in each county, local participating museums, and larger Time Team digs. Finds Gallery - highlighting the hundred most likely finds to be uncovered in the test pits. Pit reports - public viewing pages filed on-line by the participants. My Site Report - reporting application for participants to record the progress of their digs. Slide Show - each pit report had a Big Dig slide show, containing images of finds from participants. The Time Team Big Dig Forum-open to both participants and viewers. SMS text messaging service-subscribers got daily updates on finds as they happened, before the programmes were broadcast. In the password-protected part of the site volunteers could find a massive amount of training material, such as archaeological guides, safety tips, disclaimer forms, laws ruling archaeology and treasure findings. The section was also the place where volunteers could upload photos and news about their findings. organizing about 8000 volunteers for a week of digging in 1300 different places throughout all Britain would have been simply impossible without a free, ubiquitous and flexible medium like the Web. Participation: the possibility of participation in TV programs is structurally limited to a few moments and few people. Thanks to the interactivity of the Web, people could be engaged in the mass digging. On the Web, site volunteers could enlist, get training, upload their findings, receive feedback and establish networks with other volunteers and institutions; for example, get help in identifying objects. Deepening: the value of time during TV broadcasting severely limits the quantity of information that can be transmitted. This forces TV programmes to summarize and cover only the highlights, without going too deeply into a subject. The Web, with its virtually limitless storage ability, offered Time Team viewers the possibility to go below the surface all the way to the desired level. Conservation: TV program are structurally ephemeral: retrieving broadcasted materials once they are gone is usually difficult, if not impossible. Big Dig Web site offered not only a total record of the whole event, available worldwide for free, but also the same opportunity of conservation to big findings as to small ones, thus increasing the likelihood of participation, because even unlucky diggers will be remembered. This was not a one-way street. The Web offered precious enhancement to the TV program, but also got valuable things back: visibility, in the first place, as TV is still the most powerful promoting medium. But TV also proved itself a tool for emotional involvement, making archaeology spectacular for a non-expert audience, and it offered a much needed synthesis and highlighting moment for the massive operation going on. MUVI (www.url.it/muvi) is a database of more than 6000 images, collected from people living in Lombardy, about the recent everyday life in this Italian region. It is probably the biggest grass-roots effort in Italy to create a collective memory, and it is the result of an effective mixing of radio and the Web. The project was originated by Radio Popolare, a radio program aired every Sunday on local Milanese radio. Listeners were invited to digitize and send in their own photos for publication on the Web site, and at the same time to call the radio program to narrate their stories. In this way two important dimensions of storytelling, the spoken word and images, could be effectively integrated - even without television. As Giaccardi (2004) says, "integrating the communicative features of a mass medium (the radio) with a digital continuum (the Web), the MUVI project can trigger emotional and motivational mechanisms within the community". Let's go deeper into this relationship. The Web creates actual participation, because users can provide their own materials with minimal effort. The aspect of conservation of the material is central to users' involvement: people want their memory not to die, and the Web offers them the possibility of lasting storage and publication. As seen in the previous case, the Web provides also the possibility of deepening stories and concepts presented in the radio program, this time adding not only quantity but also quality (images) that structurally cannot be shown on radio. "The use of a warm medium like radio, combined with the affective value of pictures, is the key to getting people actively involved" (Giaccardi 2004). Radio allows authors to reach audiences not reachable with the Web (especially older people) but who are strategic for the database construction. Born in 1999, the project is now entering a second phase: the authors want to emphasize its multi-media format while keeping the on-line database as the core of the whole structure. For example, some of the stories collected will be transformed for representation in theatre, while a TV documentary is being produced and will be broadcast on local TV stations. At the same time, the format will be replicated in other regions of Italy with different actors and stories but with the same Web-media mixture and collective memory creation idea at its base. Lifegate, a local radio station based in Milan and founded in 2001, has been among the most innovative radio stations in Italy in the last ten years. Lifegate was a radio station without direct advertising, and almost without words: just quality music. The idea of "music-only" radio is not new; but till then no radio could sustain itself without advertisements. And advertising means spoken messages, cutting the flow of music. But Lifegate radio was just half of the Lifegate project: the other half was a massive Web portal with a large amount of content and a precise aim: to create an eco-enthusiast community of supporters for the radio and to generate advertising revenue. The only spoken message that could be heard on the radio was the Web address of the portal; since it was just a URL, it did not disturb the music broadcast, and added a particular "touch" to it. The radio programs, based only on high-quality and not mainstream music, were able to create a sense of community among the listeners and made the radio program a suitable soundtrack for creative offices or trendy, alternative shops; on the other hand, the Web site was necessary to go deeper into the concept which the radio was going to convey only at an emotional level: the idea of "different", "organic", "Nature-friendly", "cool", etc. Once again, we can see the Web acting as a participation and deepening tool, while the radio offers warmth, emotional impact, synthesis, and the possibility of reaching different audiences in different contexts (car, shop, etc.) that the Web does not yet touch. One of the interesting aspects in the Lifegate case is that by being conceived together from the first moment, both media (Web and radio) can express their features at a higher level. If the radio had to convey the rational meaning of the Web material, or the Web site had to try to create the emotional participation of the radio, both the radio and the Web site would probably have been much less successful. Newspapers and magazines soon had the problem of trying to integrate the Web within their communication formula; the Web, because of its textual nature, immediately appeared contiguous to paper media. This contiguity has been felt as competition, also at an economic level: free on-line newspapers against expensive printed newspaper. So far, this confrontation/competition has not produced a really positive integration, except for digital archiving and indexing of past issues and on-line consultancy services by specialized magazines. The recent proliferation of blogs has created a new interesting model of integration between press and the Web. Some traditional newspapers decided to integrate blogs of their journalists into their on-line edition. This way journalists have an area where they are free of space and subject constraints typical of the printed paper, since they can write as much and about what they want. This can help focus and extend the subject of their printed articles; for example, showing personal impressions or publishing on-line all the materials with the sources they cannot publish in the traditional newspaper. Moreover, readers' participation is greatly enhanced, because most blogs allow comments on their postings, again without the space limits and the selection process typical of the traditional "Letters from the readers" of the press. The news production itself is changing, since journalists link to other journalists' blogs or quote their readers' comments. This hypertextualization of the news is an intriguing process, and makes the social processes underlying news and journalism more explicit and traceable. The word conservation here acquires new meaning, because not only are news and contributions digitally available well after their paper support is gone, but also sources and comments remain readable on the Web. This process is not without shadows or problems, for example, regarding credibility and authoritativeness of journalists' blog. How much control should a newspaper exercise on its journalists' blogs? A simple disclaimer that the blogger's opinions are personal cannot be sufficient, because the journalist still has an "aura" coming from the newspaper for which he works. An interesting debate on how blogosphere and press are influencing each other can be found in the on-line proceedings of the Harvard conference Blogging, Journalism and Credibility http://cyber.law.harvard.edu/Webcred/. Even if bloggers offer themselves as alternatives to mainstream journalism, newspapers are still fundamental as a widespread, easy-to-use medium, and both Web and press can benefit from integration of the two media and from the creation of many exchange areas where boundaries between content creators and content users become subtler. The relationship between the Web and books is also quite old (in Internet terms). Amazon.com is one of the most famous Web sites, not only because it set the paradigm for e-commerce, but also because it stressed integration between books and the Web. Its readers' reviews, its rating system, its advanced searching tools and its innovative structure linking related books are all meaningful tools not only for book buyers, but also for users who have already read the book and want to share their opinions, or for bibliographic researchers. The single physical object, the book, in Amazon.com becomes part of a more complex hypertext made up of related books, readers' and editorial reviews, used books, flexible prices, etc. Users can go more deeply into the book, the author and the subject, participate in on-line discussions, and find books which are no longer sold or published. Another interesting experiment in integrating Web and books is the BookCrossing Web site, www.bookcrossing.com. On this Web site registered readers get a unique ID for a book they like; they write the ID on the physical book and leave the book somewhere in their city. Whoever gets the free book is required to post his review on the Web site and leave the book, after reading it, for someone else to read and comment. This way books are tracked during their random circulation. The community is huge (more than 300,000 registered members so far), and the percentage of books which were commented on by another reader after their release is around 20-25%. BookCrossing is interesting because it integrates the physical aspects of the book as a durable object (it can be left and picked up by someone else, it "travels", sometimes from city to city, even from state to state) with its intellectual content, which is recorded and discussed on the Web site. Finally, we have to note that particularly in the technical publishing sector the book is more and more sold in conjunction with CDs and with book sites, Web sites containing extra materials, links, updates and discussion forums between the readers and the author. The book as a finished product is slowly becoming an on-line integrated service with paper and digital parts open to updates and contributions by readers; another step towards cooperative production. Finally, we have arrived at the most interesting medium for all of us: museums. We have seen in the introduction how communication researchers tend to use a broader definition of media that goes beyond traditional media and includes every mediation system, including museums. If this is true, we should ask ourselves whether the Web and museums have come anywhere near to real integration during these years. Certainly Web sites have become more and more important for museum promotion, and there are many valuable on-line educational sections. But it is not easy to find whole museums or even temporary exhibitions structurally designed to be integrated with the Web. Usually it is the Web that adapts itself to the museum. For example the Italian Web site www.lemostreeterne.it (The Eternal Exhibitions) is an interesting conservation project which stores 360° panoramic views of past exhibitions, thus "preserving" not only their content but also their environmental design and their physical organization. a pilot project that mixes live, Internet broadcasts (Webcasts), a Web site with streaming media, Webcams, text and graphics with interactive presentations at the Exploratorium. The project is designed to take Internet and museum visitors on remote field trips to science research stations throughout the world. This way the Web is not only a mean of broadening the audience for a real event, but also a way of creating the event in the real museum. It's the place for experimental dialogue events, blending the best from science, art, performance and multimedia to provoke discussion and real engagement with the key issues of the day. What makes it interesting for us is the fact that the Web is a structural part of its events. Real discussions ignite on-line discussions; on-line forums are seen as important parts of the Dana Centre, so important that they are given the main focus inside the innovative Dana Centre Homepage. Real discussions are Web cast live and stored on the Web. The Web then is a powerful tool for participation of users and also for conservation of a structurally ephemeral event like a discussion. In art museums, the on-line/off-line discussion formula is applied also by Tate Britain, http://www.tate.org.uk/onlineevents. On-line discussions are blended with live events such as art performances or Artist Talk conversations. The Web site is also a point of access to on-line archives and references which help the focusing and deepening of on-line discussions. Integration and participation identify a media context where complexity is the rule. Multi-media formats make product life longer and more complex; the product's unity and simplicity tend to vanish. The old media context was characterized by rituals imposed by broadcasting time scarcity; TV movies were broadcast once, at the same hour for all viewers. Today, the same movie can be seen on demand or seen at different hours on thematic TV channels. Also, sport events had to change their rituals: Satellite TV programs, for example, forced the Italian Soccer league to spread matches around two or three days per week instead of the previous one-time playing on Sunday. The whole media system is changing in ways vital for museums. Copyright issues are more and more complex in a context where digital exchange and self-production of content are becoming the rule. Should a museum try to stop or encourage the publication on personal Web sites and blogs of photographs and MMS shot in its galleries? What is the limit to users' participation in museum knowledge creation? Should museums take advantage of the opening of new spaces as partners and content providers on TV digital networks? Our opinion is that the large and always growing intersection area between media, and in particular between media and the Web, offers important opportunities to museums and cultural institutions, as the case histories presented suggest. The aim of this paper is not to suggest practical ways of integrating the Web and other media, including museums. Of course the case histories presented could be inspiring for practical projects (for example, a museum could encourage curators' blogs, or create a visual or textual Wikipedia-like knowledge base about their specific subject, with contributions from users. Our focus here is to help museum communicators to identify larger trends and take advantage of new opportunities arising from the intersection of media and Web. After all, this conference itself, Museums and the Web, is a successful intersection of media, not only in the name, but also in the formula; the MW Web site with its massive on-line archive of papers (which grants conservation, deepening and participation of users) is a fundamental extension of the live meetings we are conducting here. Note: while the authors worked together on all parts, the introduction is mainly by Francesca Pasquali, while Web & TV and Web & Radio are by Giuliano Gaia and Web & Press, Web & Books and Web & Museums by Stefania Boiano. Bolter J. and R. Grusin (1999). Remediation: Understanding New Media. Cambridge MA, MIT Press. Dutton W. H. (ed.) (1996). Information and Communication Technologies: Visions and Realities. Oxford, Oxford University Press. Flichy P. (1999). The Construction of New Digital Media. In New Media and Society, 1, 1, pp. 33-39. Haddon L. and R. Silverstone (2000). Information and Communication Technologies and Everyday Life: Individual and Social Dimensions. In K. Ducatel, J. Webster, W. Herrmann (eds). The Information Society in Europe. London: Rowan & Littlefield Publisher, pp. 233-257. Livingstone S. and L. Lievrouw (2002). Handbook of New Media. London: Routledge. Ortoleva, P. (2002). Mediastoria. Milano, Il Saggiatore. Thompson, J. B. (1995). The media and Modernity: A social theory of the media. Cambridge, Polity Press.